Note: This review was originally posted in 2003 and it sadly looks like Brainwave Toys is now defunct. As a result some links will no longer work in the review. 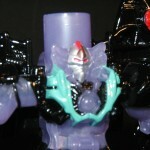 Regardless, broken links do not take away from this awesome light set. Still recommended. -Ed. Ready for some officially-licensed party madness? 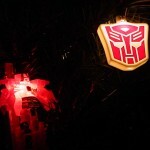 BRAINWAVE TOYS has obtained the rights to produce party lights based on several nostalgic brand names including our favorite bots from Cybertron, The Transformers! 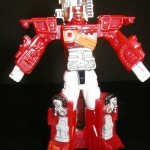 The set, due out in November of this year, features the Robots In Disguise versions of Optimus Prime (battle mode) and Megatron. We were lucky enough to score a set for review. 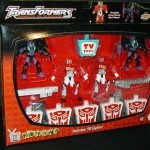 The packaging for the set is very reminiscent of the Robots In Disguise line. 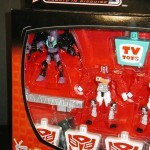 They took care to use the correct fonts and maintained the general feel of the actual toy line. At the same time Brainwave also incorporated their own personal touch into the design. 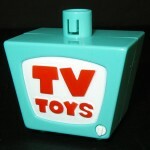 The cut out window is similar to the television picture screen in the TV Toys icon. Also notice the TV knob in the bottom right hand corner. The window is nice and big and gives you a good feel for what the product has to offer. 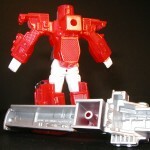 The light casings for this set are surprisingly show and toy accurate. 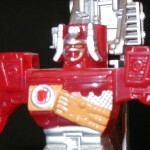 The level of detail is nice to see on a non-toy item … in fact, the only part that seems a little off is Megatron’s face. And that appears to be caused by the paint application. 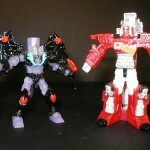 They are molded in translucent plastic … red for Optimus and purple for Megatron. 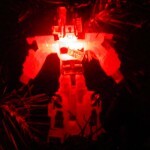 This allows the lights to shine through and make the figures glow. While much of the figures’ detail comes from their molds, some of it also comes from the paint applications and the separate pieces that attach to their backs. Optimus has yellow, white, black, and silver paint and his fire ladder. 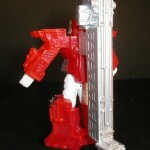 A nice detail is that his ladder is folded at the bottom, exactly as it is in his toy form. 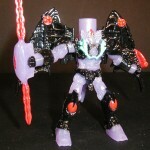 Megatron has teal, red, black and silver paint and his detachable wings. You CAN take them off … but who would want to? 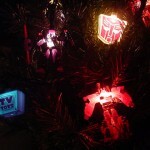 Notice how they did not paint over Megatron’s spark crystal … it glows purple when the lights are plugged in. 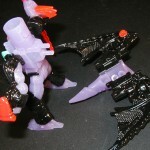 It’s also nice to see that they remembered to arm Megatron with his double-edged weapon. It adds a lot to the figure. 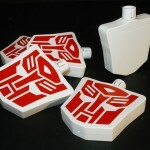 Most of the set is made up of Autobot insignias molded in white and red plastic. 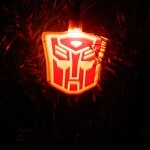 I’ve seen a few Transformers products have funny looking symbols, but they got it right. It’s also worth mentioning that these seem to be modeled after the original G1 symbols rather than the stockier RID Autobot symbols. This is where I offer my biggest (possibly only) problem with the set. 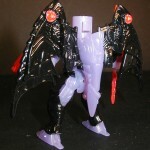 I would have liked to have seen some Decepticon or Predacon symbols mixed in. 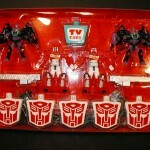 Especially since the set includes Optimus and Megatron. 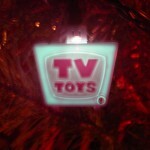 The last plastic casing included in the set is the TV TOYS logo. At first I did not like the idea of including this as part of the set. But after looking at it for a while, it grew on me. It IS a nice logo … and it represents this new company who is taking the time and energy to bring us a nice quality piece of merchandise. Some people may not agree with me on this point, but I ended up liking it. There is also a plastic bag with a few extras. 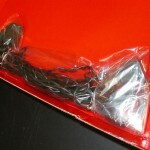 It contains a replacement light bulb and a replacement fuse for the string. It also comes with a special “blinker” bulb. 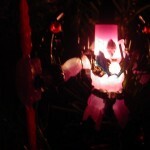 It is designed to replace one of the regular light bulbs. When it is attached to the string it causes all of the other lights to blink on and off. I thought that this was a very nice touch. Some people have criticized and wondered why, of all of The Transformers incarnations, was Robots In Disguise chosen to be produced? 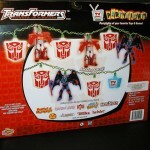 Let’s just say that this is only the first set of Transformers lights we will be seeing from Brainwave … other sets are in the planning stages, including Armada and Generation 1 with Optimus Prime and Megatron. 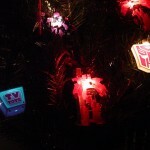 The G1 set will be out for the 2003 holiday season. Also, next year Brainwave is aiming for a broader distribution including Target, Wal-Mart and FAO Schwarz. Overall, I think the set will appeal to the die-hard collectors, the casual fan AND the children who the toy line was actually marketed towards. They call them “party lights” but can obviously be used to decorate bedrooms, collection rooms, cars (if you have the proper outlets) and Christmas trees. This is the kind of product that makes you wonder why no one has made these before and proves that there is an interest in non-toy Transformers merchandise. Thank you to Steve Hsu at Brainwave for all of the help and information. We look forward to more products from this hot new company! This is an oldie but a goodie. 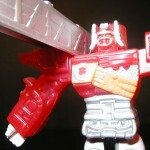 This CD is one of my favorite Transformer promo items currently in my possession. This CD was given out by Hasbro during Toy Fair 2002 to promote Robots In Disguise, a US imported and English dubbed version of the Takara Japan Anime, Car Robots 2000. 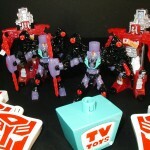 A matching Decepticon ‘Deception Returns’ sticker was also handed out alongside an Autobot brand sticker with the tagline ‘Heroes Return’. 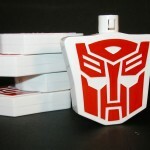 If I remember correctly, the Autobot sticker was also available in greater quantity later that year as well. 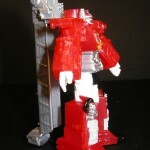 Botcon perhaps…? Check out the sideshow below while you play the 2 tracks!